The photo immediately went viral, with fans’ sweet reactions pouring in. On Thursday, the Khans’ family photoshoot in SHE Canada surfaced online, wherein the guys are seen sporting tuxedos and bowties and ladies are garbed in beautiful dresses, with the adorable AbRam tucked lovingly in his father’s arms. Late last month, Shah Rukh Khan and AbRam were seen engaged in a very cute moment during a video interview, where the little human tells the Bollywood icon of his thumb ached. 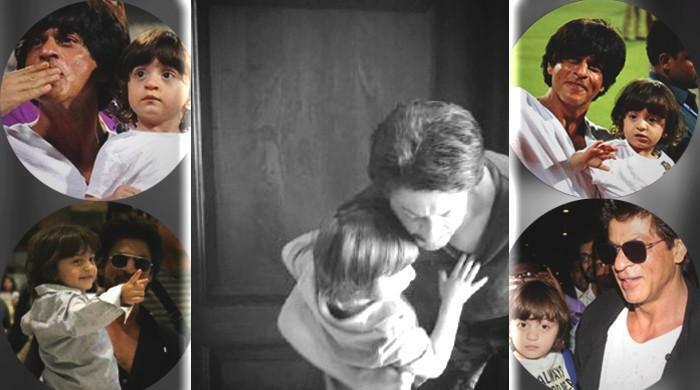 Immediately, SRK calls him over on the set, and kisses the child’s fingers, which seems to bring his world back to normal.AbRam keeps making rounds in the media with his cute antics, such as dancing to Laila main Laila, and making innocent comments.